I'm breaking my number one photo taking rule here - always have the sun to your back. I don't care for the harsh shadows and high contrast which result from a bright light source pointed directly at your face. But I felt the background was prettier facing the sun, and I suppose we all have to break even our own rules once in a while. RULE BREAKER!! Haha. I always break that rule ;) But then again my camera isn't as sensitive as yours. I love that pendant necklace...it makes such a statement! PS I think the photos still came out great facing the sun! I never would have noticed! Your pictures are always lovely, and your outfits even better! I have to agree - sometimes we must break the rules. The trousers are fab and I like your accessories here. TJMaxx has ray bans?? You're my deal-finding idol. Love your shirt + pants combo! It is really beautiful! I think these came out beautifully, regardless of which way the sun was facing...that awesome mint blouse doesn't hurt either! I think the high contrast photos actually came out really well, but I totally get loving that softer light. I am pretty jealous you got that top from a thrift store and of course I love printed pants. Well, okay, I love the whole outfit! I'm loving this super chic look! I need a class on how to take great photos! I too break that rule...often, lol! the pics came out great tho. And your outfit is super cute. Love the shoes! I don't think I'll ever learn all of the ins and outs of photography, but I do know that your photos always look great--even when you break your own rules! I love the mint and navy! This whole oufit is perfection! 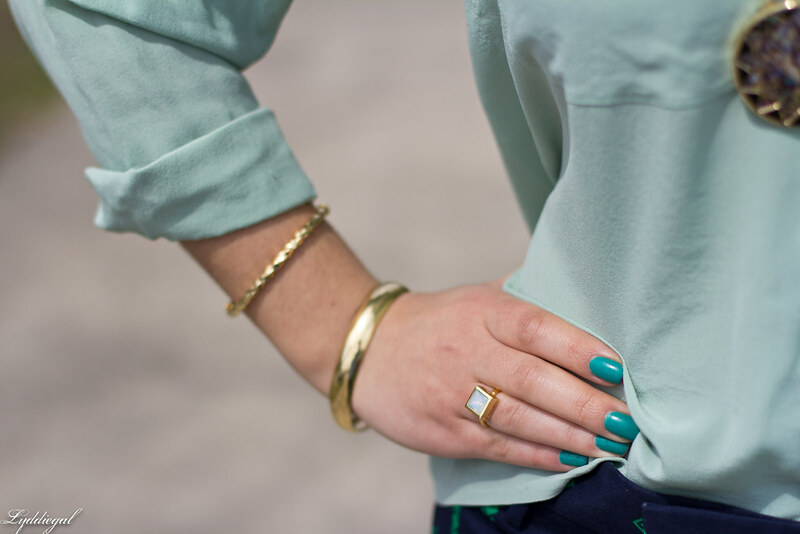 Mint and navy is a flawless combination! Thank you for the tip about photography! My hubby just bought a canon for Christmas and we are still trying to figure out blog posts! Well by we I mean he since he does the picture taking ;) You look fab by the way! Love the colors in this. These photos look gorgeous! I am really loving your printed pants! Sometimes it is worth to break the rules, like this time. You have found wonderful background which highlights your fab outfit wonderfully.Have been admiring your necklace, looks so pretty with anything you pair it. This is a great look! I love those pants! You look amazing hun, the outfit is gorgeous!!! I think the photos turned out great. Love those patterned pants too. I am horrible at looking taking photos...I just try to find a spot that I am not squinting. These pants are awesome and I love your nails. 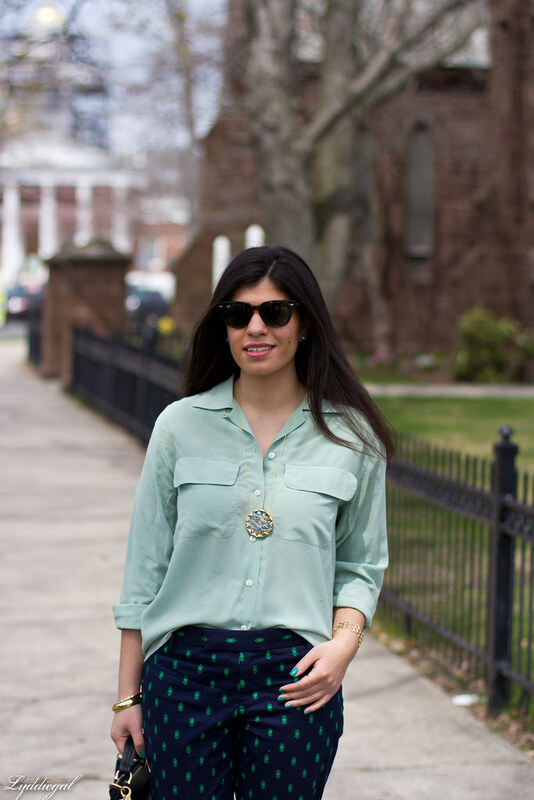 Love the combo of your minty green top and printed pants. Some rules are meant to be broken! 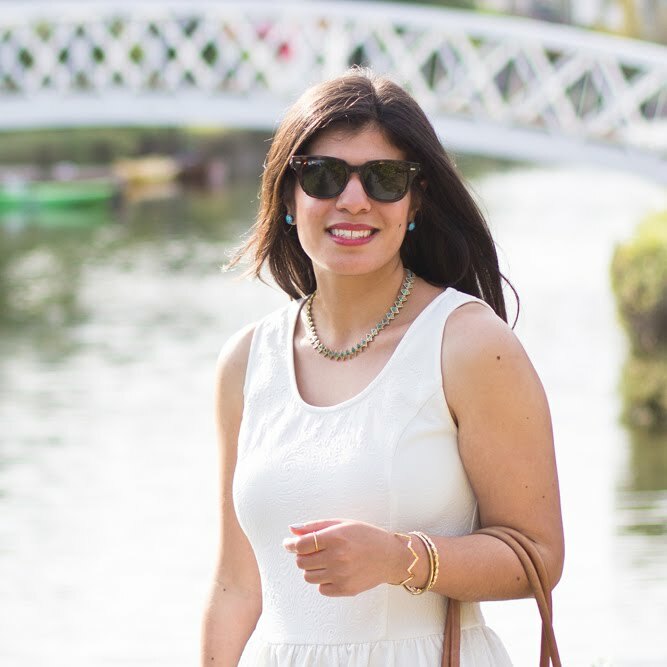 Now that it's sunnier, I need to find a flattering pair of sunglasses for outfit photos. I rarely do them in the summer because I hate how my eyes look when I'm squinting. Love the cuff bracelet! And the color of your blouse is so pretty! Sometimes you just have to break the rules. 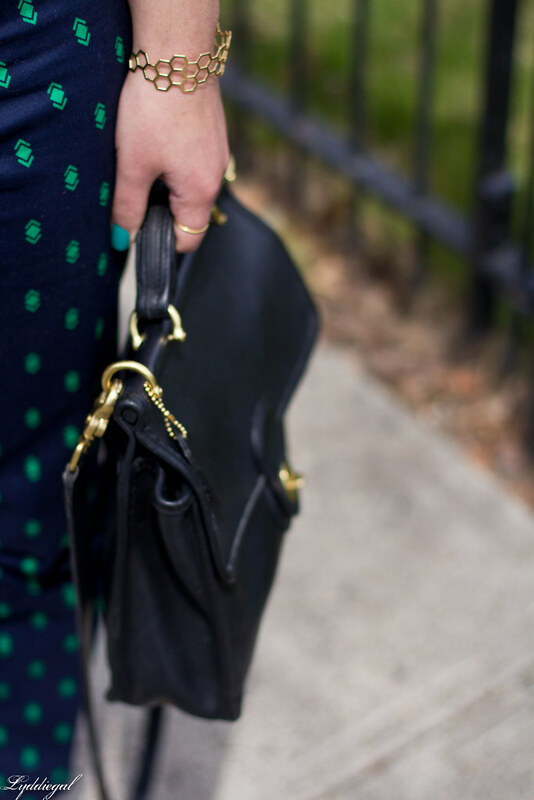 Love your pants and nail lacquer. I talk about my obsession with mint in my last post. I love your mint top. It really stands out against the navy pants. Love this look! The rule is the subject of the photo always faces the sun and the photographer has his/her back to the sun. 1. If the sun is in the subjects eyes, unless they have sunglasses on, they will be squinting. 2. If you aren't careful about your angles, the photographer might be casting a shadow on to the subject. 3. The bright direct light will create harsh shadows. Unless you have a reflector or something else to diffuse the light, I find it works best when the sun is behind the subject! Super cute outfit. I'm obsessed with those pants.